To read the full article from the Leaf Chronicle, click here. 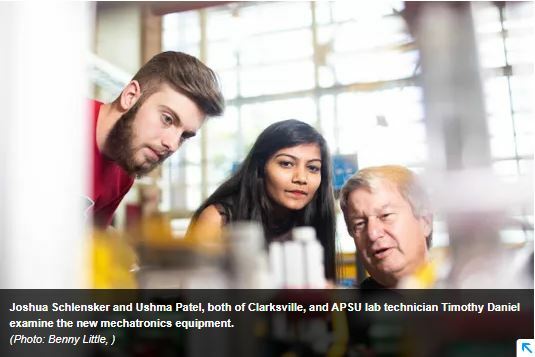 Starting in the fall of 2019, Austin Peay State University (APSU) will accomplish something only one other North American post-secondary institution has done: award a Bachelor’s-level Siemens Mechatronics System Certification Program. While several other community colleges offer certificates and Associate’s degrees for Mechatronics, only Middle Tennessee State offers a Bachelor’s Degree option. But thanks to a U.S. Department of Defense Office of Economic Adjustment grant awarded to the Pennyrile Area Development District, Austin Peay is able to add its name to a short list nationwide. In order to partner with Siemens, Austin Peay purchased high-level Amatrol mechatronics products, including the 870-series Mechatronics Learning System with a Fanuc robot. The new mechatronics system incorporates several real-world manufacturing components, including electrical, mechanical, electronics, fluid power, and programming. Thanks to the upgrade in facilities, graduates of the program will leave with a Level 3 Bachelor’s Degree, with a training equivalency of “mechatronics system professionals.” According to Siemens, graduates will be “designers of and experts on” mechatronic systems who can “design, manage, and improve” the systems. The Fort Campbell Strong initiative supports the economic health of counties near the Army outpost, and is intended to help meet the needs of military and civilian students. Currently, the grant is in its second year, and has provided almost $500,000 in equipment and training.